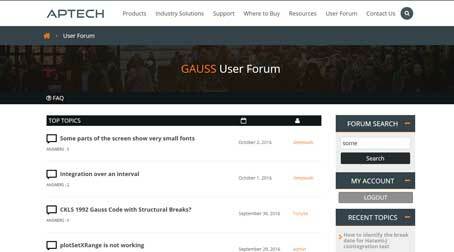 What's New in GAUSS 17? plotErrorBar and plotAddErrorBar: Create XY plots with user specified symmetrical or asymmetrical error bars. plotAddSurface: Adds a surface or plane to an existing surface plot. plotSetLegendFont: Controls the font family, size and color of the text in the legend. plotCDFEmpirical: Plots the empirical distribution function of an input vector or vectors. New color maps for surface and contour plots, make it easy to create professional and attractive 3-D graphics. Added option to place height on contour lines in plotContour. Added option to place colors at specific heights, rather than splitting the colors evenly for surface and contour plots. The terminal version of GAUSS, ‘tgauss’ and the GAUSS Engine can now create and save graphs on headless servers. View angle, lighting and toggle the mesh in surface graphs. Extent of range of X and Y axes. GAUSS HPCC (High Performance Cluster Computing) boosts the computing power of GAUSS, harnessing the capabilities of high speed cluster machines, for incredible speed and performance. Create high-level GAUSS programs that use the fast, low-level MPI library. A version of GAUSS HPCC will be made available to Universities who own a Floating Network license with current Platinum Premier Support & Maintenance at no extra charge. Support for streaming or online algorithms for data that does not fit entirely in memory. Quick instantiation with a small memory footprint allows for high performance across the cluster. cdfEmpirical: Computes the empirical cumulative distribution function. ldl: Computes and returns the ‘L’ and ‘D’ factors from a symmetric matrix. hypergeometric: Computes the hypergeometric function. powerm: Raises a matrix to a specified power. sylvester: Calculates the solution to the Sylvester matrix equation. rndWishartInv: Takes draws from the Inverse Wishart distribution. pdfWishart: Computes the probability density function of the Wishart distribution. norm: Computes the 2-norm, P-norm or Infinity norm of a matrix. dot: Computes the dot product for a vector or group of vectors. quantile/quantiled: Added option to specify the calculation method. glm: Added support for inverse Gaussian family and models without intercepts when estimating the parameters of the General Linear Model. schur: Added support for immediate return of complex form. X’X for large matrices is nearly twice as fast. sortc is much faster, especially for column vectors. Greatly improved speed of unique and uniquesa, especially when operating on string arrays. Linear solve, using the slash-operator ‘/’ for small matrices. Kronecker product ‘. *.’ is faster when one of the inputs is a column vector. crossprd is faster for case of fewer than 500 vectors. cdffc is 10-1000x faster when ‘d1’ parameter is equal to one. reclassify is much faster and uses less memory.